Background/Purpose: Lupus nephritis (LN) is a severe complication of systemic lupus erythematosus (SLE). Glucocorticoids (GCs) are recommended by ACR as one of the first line treatments for LN. Long-term clinical use of GCs, however, is associated with an array of significant side effects. To address this challenge, we have developed a novel macromolecular prodrug (ZSJ-0228) of dexamethasone (Dex) that passively targeted to the kidney, thereby effectively attenuates lupus nephritis with improved safety profile. Methods: Polyethylene glycol (PEG) was conjugated to Dex via hydrazone (an acid-cleavable linker) to create ZSJ-0228. NZB/W F1 female mice (28 weeks old) received monthly i.v. injection of the prodrug or daily i.v. injection of dose equivalent dexamethasone phosphate sodium for 2 months. The albuminuria level was monitored weekly. The end point serum cytokine panel was analyzed. The bone quality was evaluated using m-CT. The in vivo distribution of ZSJ-0228 was assessed using near infrared (NIR) imaging and the cell phenotypes that sequester the prodrug were investigated using flow cytometry. 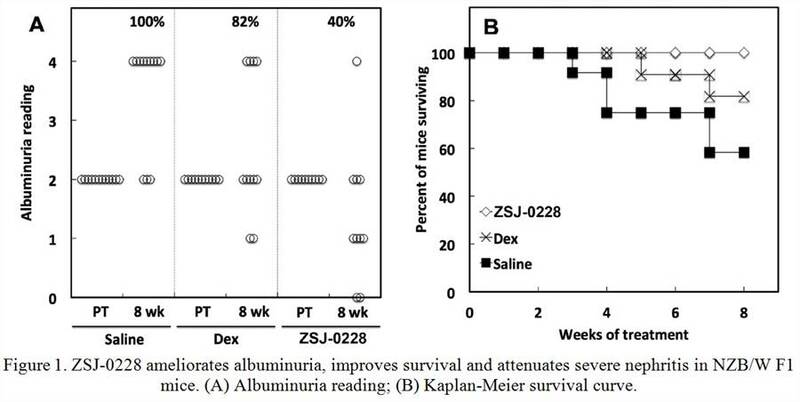 Results: When compared to dose equivalent daily Dex treatment, ZSJ-0228 markedly improved the survival of NZB/W F1 mice and is significant more effective in normalizing albuminuria; no significant systemic toxicity of GCs (i.e. WBC reduction, adrenal gland atrophy and osteopenia) was observed in the prodrug treated group; and there was a significantly lower serum level of proinflammatory cytokines (MCP-1, IFN-beta, IL-17A and GM-CSF) after 2 months treatment with ZSJ-0228. NIR imaging showed that the prodrug primarily distributed in inflamed kidneys, and FACS results suggest that the Alexa 488-labeled prodrug was mainly sequestered by intraglomerular mesangial cells and proximal tubule epithelial cells. Conclusion: Dex prodrug ZSJ-0228 significantly improves the therapeutic efficacy and safety of Dex. Further structural optimization of the prodrug may lead to a new drug candidate for better and safer treatment of lupus nephritis. Disclosure: X. Wang, None; Z. Jia, None; Y. Yu, None; K. Su, None; J. R. O'Dell, Eli Lilly and Company, Medac, Coherus, BMS, GSK, 5; D. Wang, None. Wang X, Jia Z, Yu Y, Su K, O'Dell JR, Wang D. Novel Glucocorticoid Prodrug Effectively Attenuates Late Stage Lupus Nephritis with Improved Safety Profile [abstract]. Arthritis Rheumatol. 2016; 68 (suppl 10). 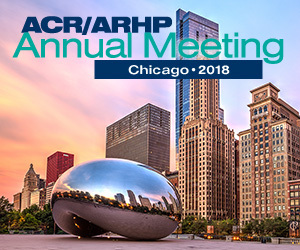 https://acrabstracts.org/abstract/novel-glucocorticoid-prodrug-effectively-attenuates-late-stage-lupus-nephritis-with-improved-safety-profile/. Accessed April 21, 2019.